While Lily has been having such great success at middle school, her little sister has been having a hard time at the start of school. I’m afraid that Zoolander’s learning difficulties I’ve been waiting for have finally arrived. Lily’s hit about 2nd grade, but for a lot of twice exceptional kids it’s 3rd grade, when the work in school gets a little more demanding. I suspected last year in 2nd grade that something was up with Zoolander. She’s never enjoyed school and she does fine, but she doesn’t respond like a gifted kid in the 99th percentile might respond. Her verbal output far exceeds any of her written output. She could barely read at the start of 2nd grade, but I didn’t worry because Lily was a late reader too and now she reads at least a grade level ahead. Zoolander was having the most trouble with writing and math. She was well behind in her math facts. The other kids has stacks of ice cream scoops on their Addition Cones. Zoolander had two. She had/has an especially hard time with time and money, especially money. No matter how many times she practiced and it seemed like she was getting it, if we’d take a 10 minute break and come back to it, she’d have a look on her face like she’d never seen a quarter before in her life. She was that way learning her numbers in preschool. We would work on them, work on them, work on them and we would think she was getting it and then 2 minutes later she wouldn’t recognize a thing. Zoolander’s handwriting is rough and inconsistent but actually somewhat better than her older sister’s so I didn’t worry about that. 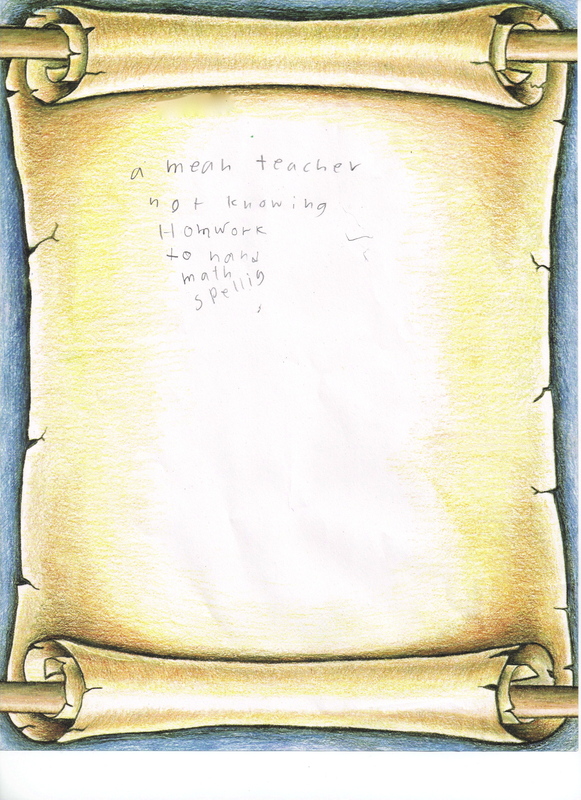 What made me start to wonder was some of her writing and spelling assignments she brought home. She was spelling words in crazy ways and reversing letters. By the end of second grade she had become a pretty good reader and was reading above grade level. She did prefer graphic novels and pretty much only read non-fiction books about the human body, but that seemed fine. It was her spelling that didn’t seem right. In 5th grade, Lily had had a learning evaluation done by a woman I’ll call Dr. P. Dr. P discovered that Lily had slight dyslexia but that she was such a visual learner that she was able to compensate for it and had no trouble reading. But it was showing up somewhat in Lily’s writing. She had trouble with encoding… or taking a word that she heard and figuring out how it might be spelled. This seemed to be what I was seeing with Zoolander. I had mentioned these concerns to Zoolander’s teacher throughout 2nd grade, but she assured me that it was just typical gifted kid asynchronous development. But after my experiences advocating for Lily, I was ready to rumble. I insisted that something was up and I didn’t care who thought I was crazy. The teacher finally agreed that I might be right and we began an RTI for Zoolander. She finally had the great idea to get a blank piece of paper and use it to try to block out the other words and keep track of her place in the list. That helped, but as I watched her copy the words, I noticed that even though she was looking at the words and silently spelling them as she wrote, what she actually wrote was misspelled. She spelled strawberry, s-t-r-a-b-a-r-y. I was stunned to realize that her difficulty might be more severe than I thought. I decided then that I need to make another appointment for a learning evaluation. I’ve got another 2E on my hands.